Designed by Jules H. de Sibour to complement the Beaux-Arts neighborhood, the McCormick Apartments at 1789 Massachusetts Avenue NW was constructed in 1915-1916. The building served as luxury apartments to several distinguished residents including Andrew W. Mellon during the time he served as Secretary of the Treasury (1921-1933) and while developing the National Gallery of Art (1933-1937). 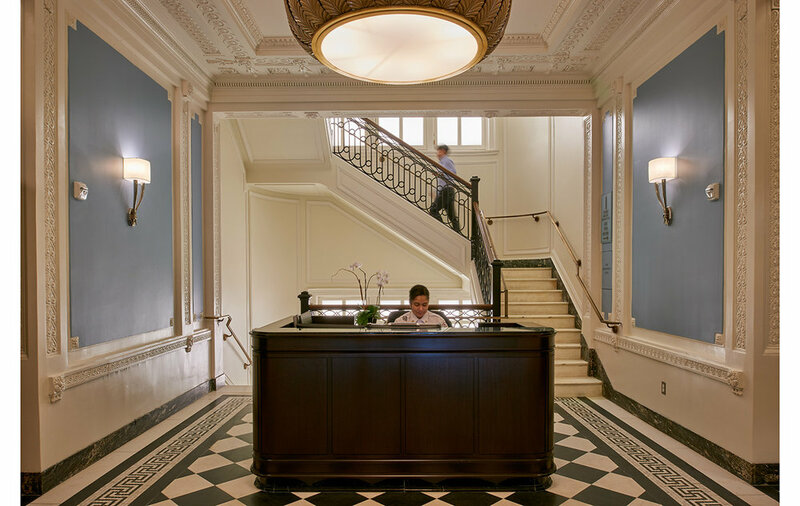 By 1941, the residents moved out of the building and it was converted to office use - first for the British Purchasing Commission and most recently as the home of the National Trust for Historic Preservation. The building was listed on the DC Inventory of Historic Sites in 1964, the National Register for Historic Places in 1973 with a National Historic Landmark designation in 1976. The building continues to be used as an office building and completed the renovation in 2016. The exterior remains unchanged except for a few minor additions. The main stair and the perimeter rooms on every floor also remain intact as do most of the interior corridors. Interior areas that have already been altered have been modified for new elevators, mechanical spaces, and restrooms. The National Trust for Historic Preservation (NTHP) retained a perpetual historic easement on the property as part of the transfer. All modifications within the protected area required review and approval of the NTHP.